Getting it wrong could trigger a replay of what happened after Lehman Brothers collapsed last fall — the stock market in free fall, seizure of the credit markets, ripples of layoffs. Perhaps even a run on other banks — so many customers rushing to pull out their cash that it would make the bank run in "It's a Wonderful Life" look like, well, a feel-good holiday movie. These days, you can roll up to an ATM at the grocery, the pharmacy, the gas station, the hardware store, the office, even the ballpark. You can check your Bank of America balance on your iPhone. You can text Chase, and Chase will text you back. That's banking today: It has grown from an almost quaint relationship between teller and customer into a massive, dizzyingly interconnected network that touches almost every adult in this country. And right now, the federal government — working without a road map, and without a net — is putting together a plan to keep U.S. banks from collapsing. Not just to get the banks lending again. To keep them alive. The government is expected to announce Tuesday a plan that analysts expect will include lifting soured mortgage assets off selected banks' books, possibly along with guarantees against other losses and maybe more direct injections of cash. Financial industry experts say it is a matter of choosing the best of several options, none of them very palatable. And no one knows for sure what will work because nothing like this has happened in living memory. "The banks are at a terrible junction," says Robert Reich, a labor secretary under President Bill Clinton. "The bottom is falling out. Almost every area of the credit markets, we're finding people unable to repay their loans. That means many banks are basically insolvent." "If one big bank implodes," he says, "the reverberations could be endless." And how do we get out? Washington and Wall Street are still playing the blame game. But most financial experts agree that a cocktail of bad economic policies and lax government oversight led lenders, borrowers and investors to take huge risks. Greed and recklessness trumped fear and reason, and they led banks to the brink. To understand how the things went awry this time, go back a couple of decades, to a time when you could walk into your hometown bank branch and speak to a teller who knew your name and kept a pen-and-paper record of your mortgage. Banking was a simpler affair, and a no-nonsense one: If you didn't make enough money to qualify for a loan, you didn't get one. But in the 1980s, falling interest rates and loose lending standards opened banking to the masses. Credit was cheaper, and the government pushed to make more Americans homeowners. The housing boom was on. Banks and savings and loan associations, or S&Ls, spread across the country offering cheap, 30-year mortgages. By 1980, banks had $1.5 trillion in outstanding mortgage loans, more than double the amount from 1976. It was, says Eugene White, an economics professor at Rutgers University and an expert on the Great Depression, all about the government's postwar policy of selling a "piece of the American dream." "But by doing that, we forgot about the risks," he says. Then came the bust. Unable to pay their mortgages, homeowners and businesses began defaulting in droves. Deliquencies soared, triggering the savings and loan crisis, battering the stock market and prompting a huge, taxpayer-financed bailout. Fast forward to today. Not exactly an example of lessons learned. Some ingredients of the S&L mess, such as cheap credit, loose lending standards and weak oversight, also are part of the current debacle. But two new trends — the rise of the global banking behemoth and the packaging of debt into securities that investors could buy and sell — made this meltdown unique. In the span of a decade, Citigroup, Bank of America and JPMorgan Chase, once bread-and-butter providers of free checking accounts, grew into international banking conglomerates that buy and sell stocks and manage assets for fees. The "universal bank" model, which took hold in the late 1990s, changed the face of global finance. And it linked Main Street with Wall Street in a way never seen before. Banks themselves became ubiquitous in American life. From 1995 to 2008, the number of bank branches grew from 81,000 to 99,000. Over the past decade, the number of ATMs swelled from 187,000 to 406,000. These banks lured first-time homeowners, many of whom believed housing prices would go up forever, with attractive lending rates and lax requirements. Bad credit, no credit — it seemed almost anyone could get a mortgage loan. But instead of holding on to the loans themselves, a modern version of the old pen-and-paper model, the banks bundled them into securities and sold them to investors across the globe. In a flash, a mortgage for a home in California or Florida could be sold to a hedge fund in London or Singapore — a huge shift. In the old days, credit had been based on the borrower's ability to pay back the loan. "But now it was based on the lenders' ability to securitize the loan and sell it," says Barry Ritholz, a financial analyst and author of "Bailout Nation: How Corrupt Money Shook Wall Street." "That is absolutely unique in the history of finance." Sure, the risks were big. But so were the rewards. Using vast sums of borrowed money, Goldman Sachs, Morgan Stanley and other investment banks bought and sold mortgage-backed securities and other complex financial products, reaping astronomical profits that helped pay for outsized bonuses for executives. In 2006, Goldman Sachs turned a $9.4 billion profit, the highest in Wall Street history. The bonanza netted chief executive Lloyd Blankfein a bonus of $53.4 million, more than any other Wall Street CEO for that year. That was followed by the $41.4 million pay package received by Morgan Stanley CEO John Mack, who led his firm to a profit of more than $7 billion of profit in 2006. But the good times didn't last long. When the housing market began to decline in 2006, subprime loans — those made to people with the worst credit — were the first to self-destruct. That caused massive financial losses at the big banks and claimed the first casualties of the financial crisis. Then, early last year, Bear Stearns, a venerable 85-year-old investment bank, began to teeter. The bank suffered huge losses tied to subprime securities. Its stock plunged, and investors raced to pull their money. Bear Stearns was bought by JPMorgan for a meager $10 a share in a government-brokered fire sale. Six months later, the crisis spread to Lehman Brothers, a 158-year-old investment bank that helped finance America's railroads. And, this time, the government decided not to step in. Lehman collapsed in the biggest bankruptcy in U.S. history. Immediately, banks around the world, seized by fear, stopped trusting almost anyone, and lending, the lifeblood of the economy, dried up. Seemingly overnight, two of the biggest names in global finance were gone. To the even greater alarm of most Americans, the stock market went haywire. The Dow Jones industrials, in what amounted to a slow-motion crash, plunged 2,400 points over eight straight trading days in October. By late November, retirement accounts were cut almost in half. To many observers, the big banks broke one of Wall Street's cardinal rules: Be greedy, but be greedy over the long term. "They forgot their instinct for self-preservation," says Lisa Endlich, author of "Goldman Sachs: The Culture of Success." This January, the government took over six failed banks, including three on a single day. Last year, it took over a total of 25. When it happens, the government swoops in and try to minimize disruption. Recently, it has tended to close banks on a Friday and achieve something close to business as usual by Monday morning, arranging for other banks to take on the assets. ATMs have kept working, and people have had access to their cash. So far, most of the failed banks have been relatively small, many with assets only in the hundreds of millions of dollars. But what would happen if one of the nation's big banks, the kind that manage hundreds of billions in assets, went down? "That would probably cause a complete meltdown of the American financial system," says Andreas Hauskrecht, an associate professor of money, banking and finance at Indiana University. After the financial crisis accelerated last fall, the government increased the limit for the amount of bank deposits it will insure for individual depositors, from $100,000 to $250,000, effective through the end of this year. And while few Americans have to worry about keeping anything bigger than that in the bank, the government could eliminate the limit altogether and insure all deposits regardless of size if a huge bank, such as Citigroup or Bank of America, were to fail, says Jim Wilcox, a professor of financial institutions at the University of California at Berkeley. No one has ever lost money in an account insured by the Federal Deposit Insurance Corp. But no one has ever seen a bank that size go under, and news of a giant bank's downfall would probably touch off a panic in which even depositors with money in safe banks rush to get it out. But there's a bigger economic problem: Other lenders, which hardly trust everybody these days anyway, would stop trusting anybody. Businesses, unable to borrow money day to day, would fail, with worldwide consequences. It doesn't take an economics degree to realize that would be nothing short of catastrophic for the economy. "Not to say there's not good aspects of letting someone fail," says Robert G. Hansen, senior associate dean at Dartmouth College's Tuck School of Business. "But the short-term costs of inflicting that punishment to everybody are really high, and I don't think the Obama administration has the stomach for it." Already, the new administration is treating the Lehman failure as a lesson. Treasury Secretary Timothy Geithner suggested at his confirmation hearing before Congress that the feds would not let another big bank go down. 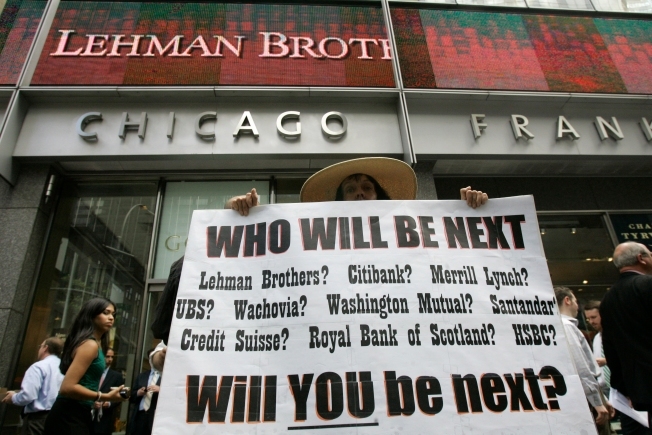 "Lehman's failure was enormously complicated, an enormously complicated set of events," he said. "It didn't cause this financial crisis, but it absolutely made things worse." Financial experts don't expect the United States to go the way of Iceland, where a collapse of the banking system last month threw the tiny country into turmoil and toppled the goverment. What keeps them up at night is a scenario closer to that of Japan, which bungled its own bank bailout in the 1990s and limped along during a "lost decade" of anemic economic growth and high unemployment. To prevent that, the Obama administration must choose the best of several difficult options, or a combination. The emergency medicine prescribed by the last administration — flooding the financial system with billions of federal bailout dollars — hasn't worked. If anything, banks are sicker. One idea under consideration is the creation of a government-run aggregator bank, or a "bad bank," that would buy up hundreds of billions of dollars in banks' toxic assets. The government also may decide to pump more money into banks and offer billions in dollars in guarantees against future losses. But no single fix is seen as a magic bullet, and financial experts say the government is quickly running out of lifelines. "The longer they wait, the more damage there is to the economy and the more it will cost taxpayers," says Frederic Mishkin, an economics professor at Columbia Business School and a former member of the Federal Reserve Board. In theory, the government-run bad bank would buy soured debt that's gumming up the banks' books and clogging the flow of credit. That could shore up banks' base of capital, soothe investors and get banks lending again. But in practice, it's far from simple. For starters, no one — including the banks themselves — knows how much these assets are worth. The complex nature of mortgage-backed securities, credit default swaps and other contaminated products has made investors too afraid to touch them. Pricing them is tricky, to say the least. If it pays too little, the government risks forcing banks to record huge losses on their books, potentially putting them out of business and wiping out shareholders. If it pays too much, it risks shortchanging taxpayers by hundreds of billions of dollars. "It's a can of worms," says Sung Won Sohn, an economics professor at California State University, Channel Islands. The forensic nightmare of appraising these bad assets forced the Bush administration to abandon the idea in the early days of the bailout. With the markets spiraling lower, there simply wasn't enough time. And even if the government figures out how much to pay for the assets this time, the question is how much to buy. Goldman Sachs estimates the government would need to shell out $4 trillion or more to absorb all the banks' troubled mortgage and consumer debt. How big is $4 trillion? It's more than one-third of the economic output of the United States in a year. It's more than twice as big as the first federal bailout and the coming economic stimulus combined. Just look at all those zeroes: $4,000,000,000,000. Another vexing issue: Who would be in charge of poring over the banks' books and valuing the assets? Experts say the people best qualified to do that are the same ones who created the faulty products — Wall Street bankers and other investment professionals. That prospect makes some financial observers queasy. "We're asking the same people who got us into this mess to get us out. These are the guys who buy airplanes and decorate their offices for a million bucks," says Bill Seidman, a former chairman of the FDIC who ran the government bailout during the savings and loan crisis. Seidman and others are calling for an alternative rescue plan that they say would avoid the pitfalls of past efforts: a short-term nationalization of the banks. To many people, that very thought is an affront to the free-market system, more Argentina than America. But that's exactly what the U.S. government did in the S&L debacle of the 1980s. With Seidman at the helm, the government-run Resolution Trust Corp. took over failed S&Ls and sold off their depressed assets — repossessed homes, offices, cars, planes and even artwork. Any institution needing help had its management fired and its shareholders wiped out. During the next six years, the RTC sold nearly $400 billion in assets on the books of more than 700 failed thrifts. Then it sold the cleaned-up S&Ls back into the private sector. The cost to taxpayers? About $125 billion to $150 billion by the time the bailout was completed in 1995, which was about 2 percent of one year's gross domestic product at the time. Seidman believes a similar plan has the best chance of success. And he claims it would cost taxpayers far less because the government wouldn't have to buy bad assets or inject more money into troubled banks. Instead, the government's expenses would be largely limited to the cost of cleaning up the seized banks and selling them back into the private sector, Seidman says. "If we don't do it, we risk staying right where we are — pumping more money into insolvent banks and keeping them alive at the expense of healthy ones," he says. That's what happened to Japan, which injected billions of taxpayer dollars into the banking system and spawned a legion of "zombie banks" — financial institutions that take government money but don't lend it out. Nationalization isn't a sure thing either. In the S&L days, the government recouped some taxpayer money by selling the physical assets of the banks, things like real estate and cars — not the hard-to-value paper assets held by banks today. That wrinkle makes it much harder for the government to follow the RTC strategy, says Jonathan Macey, deputy dean at Yale Law School and the author of a book about a government bailout of Sweden in the 1990s. "We're not talking about valuing buildings and dirt," Macey says. "This is quite a bit different." In other words, it's uncharted territory once again.